Ghostbusters was released in June 8th, 1984, and became one of the most iconic movies of the 80’s; it was directed by Ivan Reitman and written by Dan Aykroyd and Harold Ramis. This comedy movie has as a main plot, three parapsychology scientists Spengler (Harold Ramis), Stantz (Dan Aykroyd) and Venkman (Bill Murray) which decide to go into business for themselves by trapping and removing ghosts from haunted houses. After being kicked out, from the Columbia University by the principal who considers them a fraud. To help in theirs missions the Ghostbusters team uses several gizmos like proton packs, ghost traps, and on their wrists a very high tech watch. 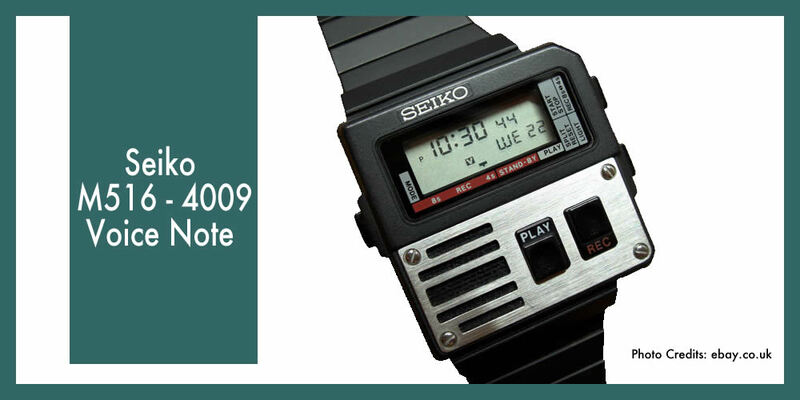 The Seiko M516-4009 ‘Voice Note’ was launched in 1983 and features to record messages of eight or four seconds, speaking directly into the built-in microphone, and through a process of digital conversion, the voice data is then stored in two 16k solid state RAM memory modules. The watch case measures 30mm x 30mm size, and it was constructed with carbon-fibre and stainless-steel, carbon fiber was quite rare these days in the wristwatch industry, few models were produced and its price tag was high, and still is at any vintage shop or auction site.